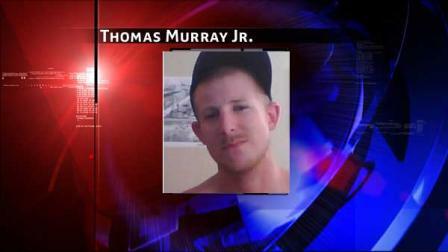 Authorities are searching for 24-year-old Thomas (TJ) Murray Jr. He was last seen leaving a Montgomery County sports bar after midnight on October 19. HOUSTON (KTRK) -- The family of a missing Sam Houston State University student is not giving up on locating him. Thursday marked the three-month anniversary of T.J. Murray's disappearance. The 24-year-old was last seen at a Spring sports bar in October. I am so happy to see that KTRK -Houston did an update. I wish Montgomery County Sheriff's Office would do a Press Conference with the greater Houston media, give an update on TJ's case and plea to the public for information and leads in TJ's case. If MCSO does not have the resources to investigate TJ's case, I think they should request the assistance of the Texas Rangers. I hope TJ's family have the opportunity to meet with MCSO and request that MCSO request the assistance of the Texas Rangers. Today marks the 3-month anniversary of TJ Murray's disappearance and his family is seeking help in locating the missing Sam Houston State University Student. January 19, 2012 has been three months since TJ Murray, Jr. went missing. Special prayers that TJ will be found soon. Also, praying for TJ's family. Whoever knows what happened to TJ need to come forward. Call Montgomery County Sheriff's Office and let them know where TJ can be found! Although the articles about TJ Murray missing 3 months may be the same or similar, I'm going to post all of them to keep a "record" of which media are covering this story. Good to know when seeking media coverage! HOUSTON - Wednesday marked the 3-month anniversary of TJ Murray's disappearance and his family is seeking help in locating the missing Sam Houston State University Student. A MESSAGE FROM TOM MURRAY: I just got the word that Tom Murray wants all the help we can give him to find his son. He is welcoming all tips and rumors, and taking notes, for he is desperate to find his son, TJ. If you want to post them on here, that is fine. If you want to send a private message, that is fine, too. I will make sure Mr. Murray gets the information. We all know that TJ got in an altercation with a girl that night. Her boyfriend/friends were NOT happy. However, from what I understand, many of these "friends" have been given lie detector tests and have passed them. So what happened to TJ? Isn't it strange that he disappeared after an altercation that night? Did he upset people so bad, that they called some buddies to go after TJ? TJ did not fall off the face of the earth. Any information you have would be greatly appreciated! 21 hours ago · 1. I strongly believe in prayer! Not a day goes by that I don't pray for TJ and his family. God hears our prayers and I know he will lead us in the right direction. Tom Murray, TJ Murray's father, and TJ's mother need to find TJ and bring him home. TJ, a Sam Houston State University (Huntsville, TX) student went missing in The Woodlands, Tx area on 10-19-11. Both of TJ's parents are school teachers and continue to work. Tom Murray, TJ's dad is also a coach at Oak Ridge High School in Montgomery County, Tx. Please share any and all information you may have, or may have heard. Mr. Murray is gathering any and everything he can get his hands on. This case is not cold. The Murrays are continuing to work closely with LE. If you have any information, please call the Montgomery County Sheriff’s Department at (281) 297-6500 or Texas EquuSearch at (281) 309-9500, or you can message me and I will send it directly to Tom Murray. Your name will never be given out on Facebook!! The Murrays greatly appreciate everyone's help and prayers. NEW SEARCH being put together for the next week or two. Please INCLUDE contact info, and if SATURDAY the 28th or SATURDAY, FEBRUARY 4TH would work for you. Please, pass the word. Email H_FRC@yahoo.com with your information. If you were on the last search, please let me know. ALSO, we need LOTS OF HELP! Let's bring TJ home! MANY, MANY mapped places to search! Now that a new semester has started, The Optimist Club at SHSU will be trying to set up another day to sell the bracelets and raise awareness of TJs story. I'm looking for volunteers to help sit at the booth and pass out reward fliers. I don't know how you can miss someone that you never knew, but I think of TJ and his family often. Last semester's booth brought a lot of attention to TJ, and we only had a handful of volunteers through the week. If you are interested, please let me know. Let's bring our BearKat home! Folks, we need your help for the search on February 4th! I have spoken to Mr. and Mrs. Murray and they stand behind it 110%! If you would like to volunteer, please send an email H_FRC@yahoo.com. Let's bring TJ home! Such GREAT News!!!! PLEASE REPOST on your wall! Let's bring TJ home! We need your help for the search on February 4th! If you would like to volunteer, please send an email to Hannah McDonald at H_FRC@yahoo.com. Please Repost - Lets get the word out and as a community come together to help The Murray Family!!!! Please light a candle for TJ Murray . . . that he may be found soon! An exclusive candle group was set up for TJ Murray some time ago. The title is: TJM. There is no charge to light a candle. Please keep the candles burning for TJ! Many thanks! Bumping! Please light a candle for TJ Murray! Thanks! Thanks Ann, I got a new laptop and did not have that link saved to this one. sitemama, thank you for lighting a candle for TJ. Prior to you being hospitalized, I noticed you always had a candle lit for TJ! I found this blog which is a website whose goal is to raise awareness for missing college-age men throughout the Midwest and Canada (per the website). TJ Murray is featured. The site owner has also included a place to click on (under TJ's picture) for the official missing person poster. TJ Murray has been missing since Oct. 19, 2011. Please continue to pray for TJ, and support the Murray family! Let's keep spreading the word about TJ, so we can keep his story out there and keep this case from growing cold. Please keep passing out flyers, join in on the search, keep praying, keep donating, and purchasing wristbands, keep reposting/sharing this page! If you have any information, please call the Montgomery County Sheriff’s Department at (281) 297-6500 or Texas EquuSearch at (281) 309-9500. If you prefer to give your tip directly to Tom Murray, please message me with your contact information. He will get back with you. Thank you! ...Always praying! Just wanting to clear something up. Per my statement above that it is my understanding that "friends" of TJ have passed lie detector tests, please note that I read this on the Bring TJ Murray Home facebook page. It was posted by another member on FB, so it is simply hearsay. This may, or may not, be true. I do not ask Mr. Murray, nor does he volunteer, details of this case. I respect that. Thanks. I do not do Facebook but the Link I've provided as the "source" below info I copied and pasted here from the "Facebook Bring TJ Murray Home Safe" page is the Link available to non-members. No worry about your comment. When I posted your comment from the Facebook page, I took it as it was your understanding and not fact from Montgomery County Sheriff's Office or Tom Murray, Sr. Thank you for clearing it up even though I did not take it as fact; just your understanding. I usually don't post comments from Facebook pages on any of the threads here but there has been some informative info posted on Bring TJ Murray Home Safe regarding the sale of the bracelets at the SHSU campus, the "birthday party" for TJ, the upcoming search this Saturday, 2-4-12, and the organizer(s) seeking volunteers, the billboard on I-45, etc. I am really impressed with Bring TJ Murray Home Safe Facebook. Although I do not do Facebook, it is my hope that folks who do Facebook will "join" or follow Bring TJ Murray Home Safe if they see the Link posted on TJ's thread here. DebbieK, thank you so much for taking the time to post here on TJ's thread. This is an open thread and you and any registered members are welcomed to post info, comments, prayers, and other pertinent info here. 10-26-11. By the time you read this, that number may be higher. For your info, if you ever want to Personal Message me here at Reality Chatter, click on the Inbox at the top of the page in the Header. It will take you to your personal message page. Click on New PM left side. A page will open for you to type a personal message to whomever. Subject: Whatever the subject is, i.e., TJ Murray. Then type your message in the big white comment box. Below the comment box, you can click on Preview to see what your message will look like. If you want to make any changes, corrections, etc., go back to your white comment box and make your corrections. No one has access to your PM account here except you. By being a member and posting at least one comment (which you've done), you automatically get a "free" PM account here! It's a really cool feature and I love it! For your info, Justice4All and FystyAngel own this site, Reality Chatter. Justice4All is the Site Administrator and he does an awesome job of keeping this site a first class site with remarkable features. The purpose and goal of this site is to bring awareness to the missing and support justice for the victims of crimes such as murder. Although there is a lot of focus here for missing children, we do cover many missing adults such as TJ Murray. DebbieK, if I can ever be of any assistance to you, please do not hesitate to PM me. I am so glad and honored that you, a Facebook - Bring TJ Murray Home Safe member, has joined here in support of the TJ Murray Missing thread at Reality Chatter. I pray that TJ is found soon. It is past time for TJ to be returned to his family. My prayers and thoughts are always with TJ's family. A day does not go by that I do not think of TJ and his family. Thank you Ann, and I LOVE the flowers! My heart and prayers go out to all families missing a loved one. Small children and the elderly especially tug at my heart, for they cannot defend themselves. Nevertheless, everyone missing is someone's child, mother, father, sibling or friend. It's so hard on the families. I'm thankful for sites, such as this, that focus on those that are missing. I know the families surely appreciate the public's concern and prayers. I understand what you are saying regarding small children and the elderly. I feel defenseless children, the cherished elderly and animals are three segments of society who are the most vulnerable and I advocate for all three. My heart goes out to the families of the missing. Their pain over a loved one missing is something I hope I never have to experience. We cover numerous cases here. If you click on Forum (at the top Header), it will take you to the forum where all of the cases are. Justice4All has the cases in sections, i.e., Missing, Unsolved Homicides, Current Trials, Awaiting Trial, Closed Cases, etc. Also, you might be familiar with precious 4-year-old Emma Thompson from Spring, Tx who was brutally raped and beaten by her mother's boyfriend in 2009. She died of her injuries. Emma captured the heart of many world wide. The case is now in Closed Cases but I will continue to keep her thread updated due to Appeals and her mother's parole when she is eligible for parole. Debbie, will you be able to participate in the search for TJ Murray on Saturday, Feb. 4? I hope they don't have to call it off due to the rain. If you know how the search goes, please give us an update here. We would be most appreciative. Thanking you in advance! Well I need to go. Just saw this on the Bring TJ Murray Home Safe - Facebook. The search has been rescheduled for Saturday, 2-18-2012. I'm sorry to say, but SATURDAY'S SEARCH IS BEING CANCELED AND RESCHEDULED FOR SATURDAY, FEBRUARY 18 DUE TO WEATHER. I just got off the phone with Mr. Murray and he agrees we need to wait since there is a 70-80 percent chance of thunderstorms. PLEASE do NOT be discouraged, this is a part of God's plan as everything is. Please continue to pray and please be there the 18th! Does anyone know what color SHORTS TJ was wearing that evening? I know he was wearing a red shirt and I was told white swim trunks? Anyone able to back this up? Miscellaneous Notes: Last seen wearing a red t-shirt with white lettering, khaki shorts and a dark colored baseball cap. Missing person is a student at Sam Houston State University.
. . . black & white swim shorts . . . The official TXDPS poster states khaki shorts; TES states black & white swim shorts. If I were Hannah, I would call the MCSO lead investigator on TJ's case and get clarification. If one is searching, it would be helpful to know what the person was assumed to be wearing. Or perhaps Mr. Murray knows what TJ was wearing. DebbieK, if you see this would you please provide Hannah with the above info? Thanks! I posted on TJ's facebook page to Hannah. I have no idea what color shorts TJ had on when he disappeared. Calling MCSO is probably her best bet. Mr. Murray may know! Answering your question, Yes, I've heard about Ali missing up here in Spring. She has been missing a good while..so sad. Also, the case of little Emma breaks my heart. I know a lady that worked at the daycare little Emma went to. She told me that one day, when she was leaving work, she saw a man standing out by the street. She reported this to her Director. Later she learned, that this was the boyfriend of Emma's mother. He was ordered to stay away from this child, but he didn't. When they pulled out of the parking lot, he got in the car. Another time, his little boy came to daycare, with bruises all over him. They called CPS. Bottom line is I think CPS dropped the ball on these children. These children endured a lot before little Emma was murdered. It is just devastating. DebbieK, thank you for posting the message to Hannah. Either today or tomorrow I will respond to your comment about Emma on Emma Thompson's thread or perhaps PM you. I think the lady at the daycare was talking about Emma, Lucas Coe's daughter. He has a daughter named Emma who he was not allowed to be around unless he was supervised by one of two designated people. (per CPS) Also, Coe does not have a son. Maybe the lady was referring to Coe's previous girlfriend's son. Julie of Reality Chatter and the The Hinky Meter brought the following to my attention. Erin Browne of NBC NEWS - Peacock Productions - Associate Producer is looking for families and close friends of people who have disappeared for possible inclusion in the Investigation Discovery show, Disappeared, in its 5th season. If you know of any one that has some one missing or an unresolved case, please forward the Link to them. It is an avenue they might be interested in pursuing to bring attention to the case of their loved one. Erin Browne details the required criteria in the e-mail. The e-mail address of Erwin Browne is included. Your submission would be direct to Erwin Browne. The following is an e-mail Erin Browne sent to "Help Find the Missing.org". Also, Julie started a thread here at Reality Chatter in this regard. It can be found in the Forum - Missing. "Happy Valentine's Day" to TJ . . .
wherever you are. Special prayers that you are found soon. God speed! There was a search for TJ Murray on Saturday, 2-18-12. The following is a comment from Hannah McDonald. It appears she was the organizer of this search. Per her comment below, the next search will be on Saturday, 3-10-12. The search went very well today! Lots of ground was covered! Thank you SO MUCH to everyone who came out, and a thanks from the family as well. The next search will be Saturday, March 10. After the disappearance of his son Oct. 19, Tom Murray has doubled the reward for information on his missing son T.J. Murray from $10,000 to $20,000. The first reward amount Tom Murray offered was for $5,000, which he then raised to $10,000. He just increased the reward again to $20,000, he said Wednesday. Bumping to new page so everyone can remember to light a candle for TJ. Thanks, sitemama, re bumping the candle site! The father of a missing Sam Houston State University student has doubled the reward for information about his son. The Montgomery County Sheriff's Office said Thomas "TJ" Murray, 24, was last seen at Rookies Sports Bar on Sawdust Road shortly after midnight on Oct. 19. He spoke with his father at 12:30 a.m. that morning to say he would not be driving home. The student's father said he is now offering $20,000 for information that helps find his missing son. The huge billboard sign on I-45 has been updated. I hope some one will take a picture of the updated sign on I-45. A pic of the info on the sign; not the actual sign. The father of a missing Sam Houston State University student has doubled the reward for information about his missing son. Thomas Murray Sr. is offering $20,000 for information about Thomas “T.J.” Murray Jr., according to KPRC-TV (Channel 2). His son has been missing since Oct. 19, 2011. KBTX - Bryan, Tx updated their article (see Link in above comment) re TJ Murray and added a video from the newscast. Please, Please won't everyone light a candle for TJ? It only takes a minute to do, so I usually light 2 and am trying to remember to do this every day. sitemama, thank you for the reminder. The family and friends of missing Sam Houston State University student, Thomas "T.J." Murray Jr., has doubled the reward to $20,000 for any information that can be given about the vanished young man. 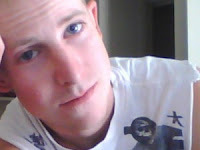 Murray, 24, has been missing since Oct. 19, 2011. He was last seen leaving the On the Rocks sports bar located at 592 Sawdust Road in South Montgomery County, shortly after midnight on Oct. 19, according to the Montgomery County Sheriff's Office. The following video is posted on Facebook Bring TJ Murray Home Safe. Beautiful song! With 40 people missing from two adjoining counties, is there something sinister or is it just a coincidence? About 10 months ago, I was contacted by Jerry, the brother of missing Larry Baker that disappeared in Liberty County in 2010. Jerry told me about Larry and he also brought up the name of another person, Rodney Stokely that was missing from the same small town in Texas called Cleveland. 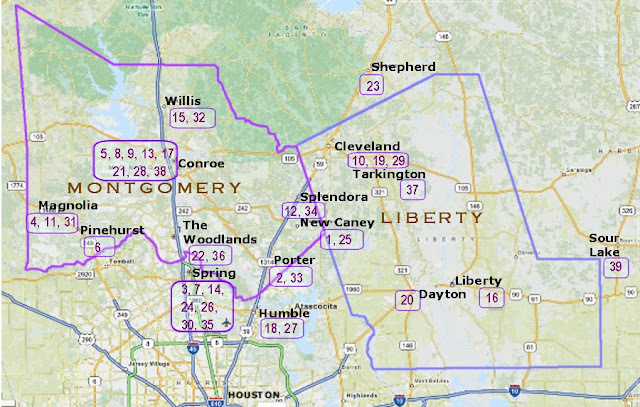 Cleveland, Texas has a population under 8,000 people. Two people missing from one small town seemed usual to me, and you would think that the odds would have it that the police would have found at least one of these men. TJ, who was a 24-years-old and a student at Sam Houston University in Huntsville also umpires Little League in the Woodlands. On October 18, 2011, after he finished umpiring a game, he met with some friends at The Rocks Sports Bar located at 592 Sawdust Road. They were to meet an Army buddy on leave there but the friend was delayed. They then shot some pool and at midnight TJ called his father and told him he was leaving his father’s truck at On The Rocks and was riding with friends to Rookies at 305 Sawdust Road just a short distance away. At 12:30 a.m. he talked to his father again and said he was at Rookies and had been separated from his friends, but would return his father’s truck to him the next morning at Oak Ridge High School, where his father is a a teacher and a coach. On October 19, his cell phone was found in a nearby ditch and the truck in the parking lot of the first club. TJ has not been heard from since. His father said it is not like him not to call him or any of his friends. In continued efforts to spread the word to our community as well as raise more money for the Murrays reward fund. We have stickers available for $5. We will be at Papas Ice House Wed. 3/14/12 @ 5:00 - 7:00PM. We will also try to set up a booth on Sat. Location and time still to be determined. Heard this song this morning and I just had to share! You ALONE do make a difference and an impact, but with Christ anything & everything becomes possible! Please pray that today be the day that God is able to break through to the people who know where TJ is so we may bring him home to his family and they may have peace! Bumping again. Please light a candle for TJ, lest we forget about him. sitemama, thank you for bumping the candles. I went and lit two candles for TJ. You are always so great about reminding us. Thanks for your support of TJ. I am sure his family appreciates it. Don't forget to light the candles tonight. sitemama wrote: Don't forget to light the candles tonight.